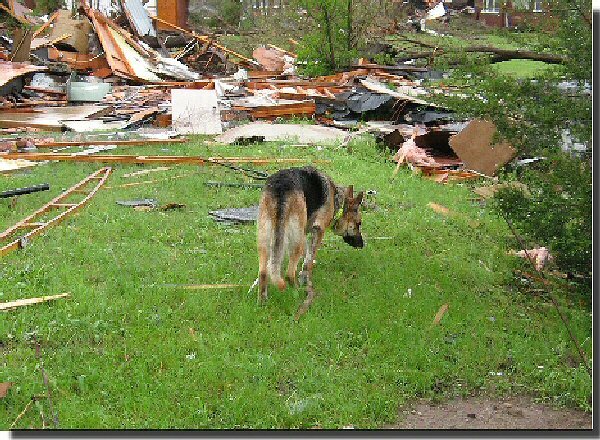 K-9 Search and Rescue of Kansas was formed in the summer of 2005 with the goal of using trained Searchers and Search and Rescue dogs for the purpose of saving lives. Members of our team have extensive training in ground searching, tracking, search management, and search dog handling. Some of the classes that our team members have been involved in are Managing the Lost Person Incident, many levels of NIMS classes, High Angle Rescue, and Confined Space Rescue. Our team members have completed the National Association of Search and Rescue Fundamentals of Search and Rescue course (FUNSAR) and were certified as SARTECH IIs. K-9SARK is fortunate enough to have members on our team from many different occupational fields, including police officers a firefighter/Paramedic, several EMTs and firefighters. With the certifications and training that members of our team have, we not only bring searchers and search and rescue dogs to help in a disaster, but we can also assist in search and disaster management. Our K-9 teams are nationally certified by the National Association of Search and Rescue (NASAR) at the minimum of Search and Rescue Technician III, most dogs hold higher SARTECH II or I certifications. Our team will respond free of charge only after receiving a call from an emergency management agency, (Police, Fire, Sheriff or Emergency management) and can help with any of the above-mentioned tasks. Many Team Members are cross trained as CERT Team Members as well. All Services Are Provided Free Of Charge. Call Out Numbers (for Emergency Agency use only): Western Ks (316) 655-0349, Central Ks (316) 773-4026 or (316) 641-2862.